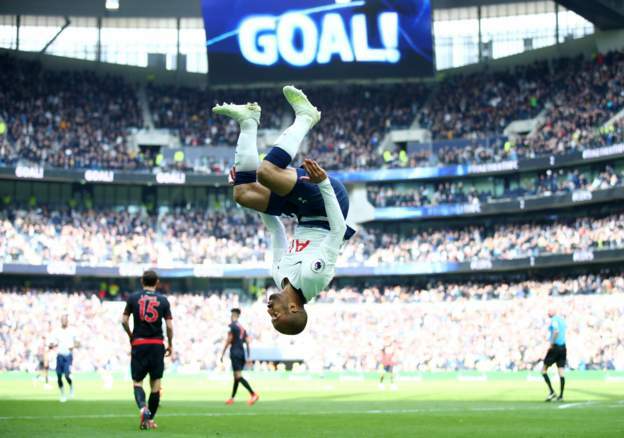 Lucas Moura scored a hat-trick for Tottenham Hotspur in their 4-0 win over Huddersfield in the Premier League on Saturday. The Brazilian’s incredible display earned him a name as the first hattrick scorer in Spurs’ new stadium. The victory boosts the hosts’ chances of finishing in the top four of the English top flight this season. They seat on third spot, a point above fourth-placed Chelsea, who face Liverpool in the tie of the round on Sunday. Spurs dominated over relegated Huddersfield from the start and deservedly went ahead when Victor Wanyama slotted home midway through the first half. Moura doubled the lead just 144 seconds later as he rifled a low shot past the visitors’ keeper. He was on the scoresheet again three minutes from time as he controlled and volleyed home Christian Eriksen’s cross. And completed his hat-trick deep into injury time with another emphatic finish. Spurs will be playing against Manchester City at the Etihad in the Champions League on Wednesday and both sides will face again in the Premier League next weekend. Meanwhile, Huddersfield remain bottom and they have now lost six consecutive league games.